Interactive sessions provide direct access to software modules hosted by MSI. They also provide direct access to all of your group’s data on our MSI-wide network file system. Use interactive sessions to prototype workflows, compile code, edit source and analyze/visualize data. When prototypes are ready to run at scale on our HPC systems, use interactive sessions to connect and submit batch jobs on the HPC resources. Benefits of Interactive Sessions vs SSH? Most users feel more comfortable interacting with GUIs over shell prompts. Interactive sessions give users the look and feel of a personal Linux laptop/workstation, but also includes all tools, modules, and data one would access via the command line. Why struggle to learn magic incantations on the command line when you can point and click your way through everything including visual debuggers/profilers, text editors, visualization software and data transfers. Navigate to nice.msi.umn.edu in any web browser. 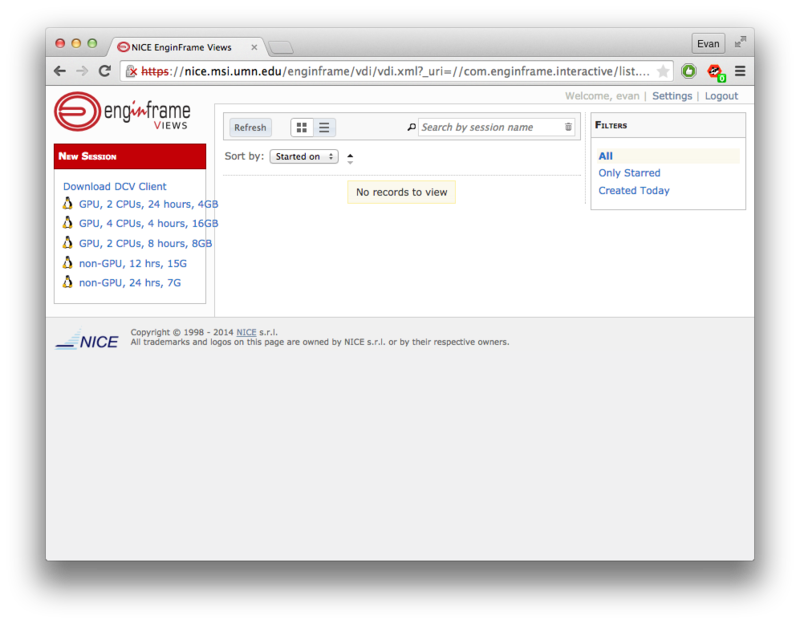 Click on the Download DCV Client link in the top left corner of the page. Download and install the appropriate client for your system. MSI interactive HPC resources are accessed via web browsers. You must be on the UMN campus network to connect, if you are connecting from off-campus a VPN connection to the UMN network is required. 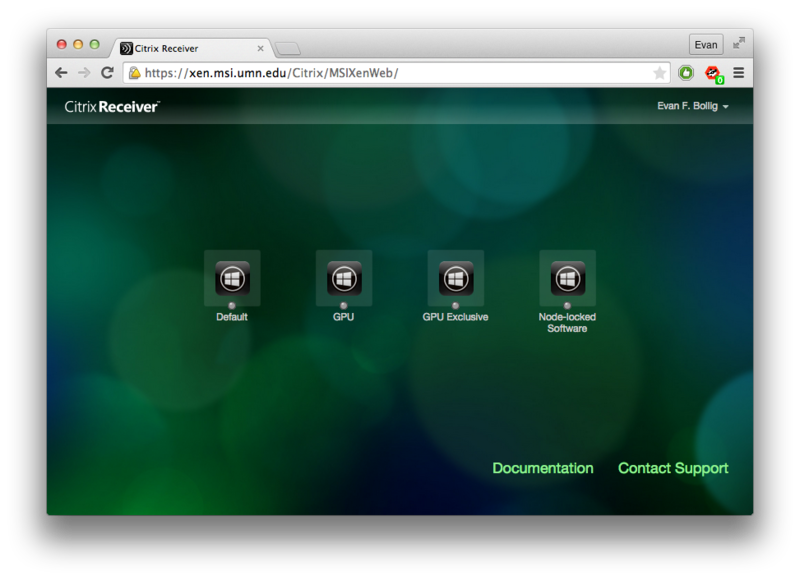 After downloading and installing the Citrix receiver, navigate a web browser to xen.msi.umn.edu and use your MSI username and password to log on. Choose a VM pool to fit your requirements. Default -- A standard Windows 7 session with 2D graphics. Ideal for development, data management, and non-graphics related computing. Most users find this pool more than adequate for their needs. GPU -- Backed by a shared GPU for multiple users on the same server. Use this pool for applications with low to moderate graphics requirements. Node-locked Software -- Contains titles like GenomeStudio, that have restricted licenses limiting software availability. Only software designated as “node-locked on Windows” are installed in this pool. 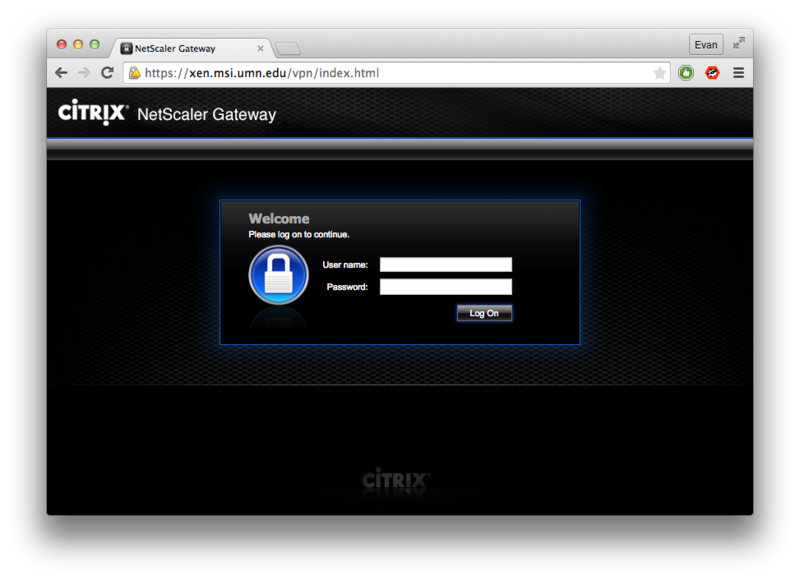 Once you select the VM you need the Citrix plugin will launch opening a new widow. 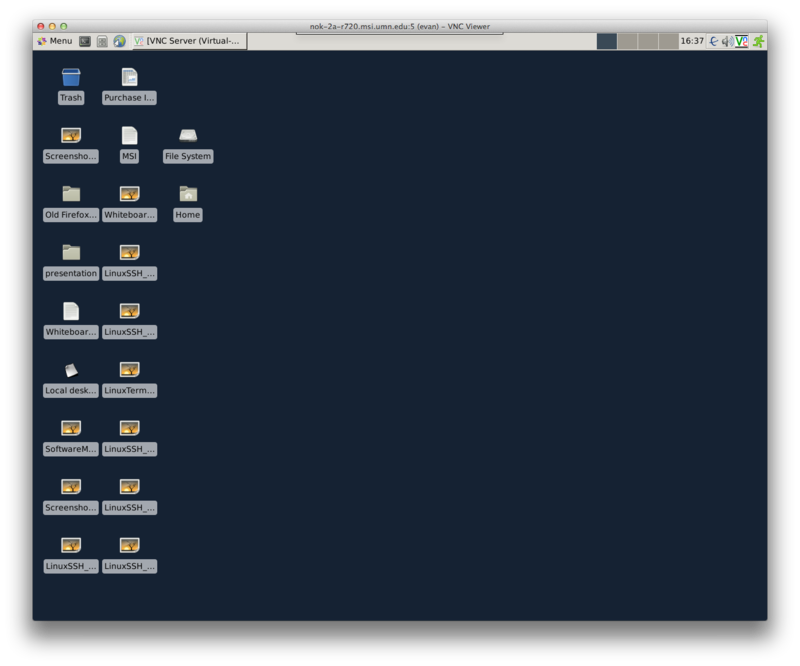 This window may stay blank for a few minutes while the VM launches. 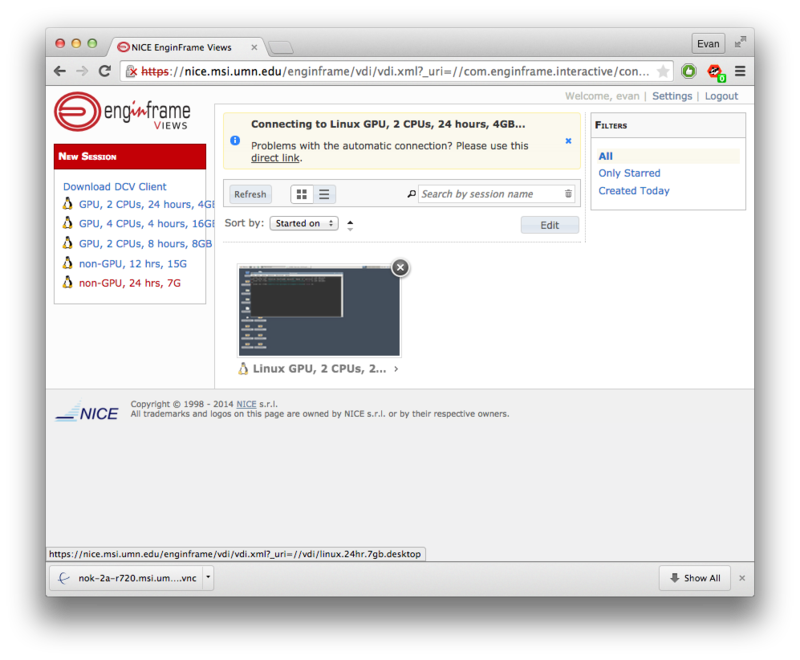 Log into NICE with your MSI username and password. Choose the appropriate session type from the left menu. GPU session are backed by shared GPUs for applications with moderate to high graphics demands. Non-GPU sessions are backed by standard CPUs and are useful for non-graphically demanding computation. These session are similar to using the Lab computer cluster interactively. Wait while your Linux session is built (status: "Pending"). When the session is ready for connection a *.vnc file will download. Open the *.vnc file, this should launch the DCV client, to connect and open your Linux desktop. If prompted, click "Yes" to accept the signature and continue connecting. You will know you session has started when a desktop environment pops up. Once the interactive Linux session has started you are able to access MSI software resources and run command line tools by opening the terminal application in the Linux environment. By starting the session you have reserved the computational resources outlined in the option you selected from the NICE menu. Once connected to the login node you can access and use the other MSI systems as outlined in the Connecting to HPC Resources quick start guide.